Dr. Babasaheb Ambedkar birth centenary celebration Committee, Government of Gujarat decided in 1992 to give one time grant of Rs. 5 Lacs to establish Dr. B. R. Ambedkar Chair in all the Universities of the state. Gujarat University, Ahmedabad was also given a chair, which had to function out of the interest earned form this one time grant of Rs. 5 Lacs. Gujarat University invited and nominated Dr. M. H. Makwana, Professor & Head, Department of Sociology as a chair person of Dr. B. R. Ambedkar Chair. The administrative work of this chair is looked after by the Dy. 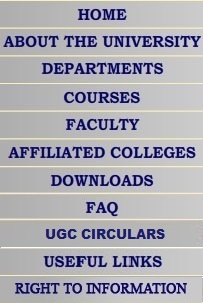 Registrar SC/ST Cell of the University Office. Since June 1998, the chair has organized Four National Level Seminars, Four State Level seminars, One workshop. Fourteen series of lectures in the Department of Sociology, Economics, History, Law and of Labour welfare. The chair has also organized debates and various competitions for undergraduates and post graduate students on different issues and topics related to Dr. Ambedkar�s ideology, Life and Mission.